I bought this top from one of Kate Spade's online surprise sales. I've been wanting one of her graphic tops for awhile now so when I saw that this top was $100 cheaper then the original price I knew it was my chance to buy it. I love playing with different styles and one of my favorite styles is the "Parisian look." Which obv. this top totally has. When I received this top in the mail I knew I wanted to play with the Parisian style but put my own New York spin on it. Toughed it up with a motor jacket and boyish touch of the loafers. But kept it girly and classic parisian chic with a tulle skirt. 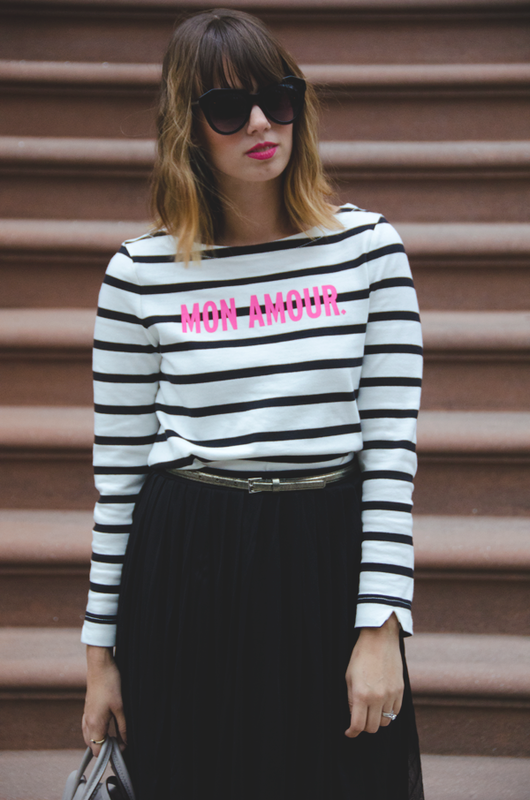 The tulle skirt is very pretty, and so is the striped shirt! Love this look a lot! I love the bright pop of pink against the black-and-white stripes. So cute! I am always always tempted by the Kate Spade surprise sales, but I haven't actually bought anything during one of them yet! Lookin good girl! :) I love stripes. I must have 10 black and white striped shirts. They are so versatile! That sweatshirt is sooooo cool! LOVE how you put it with that skirt and loafers! SOOO NY!